Don’t toss that plastic bottle! 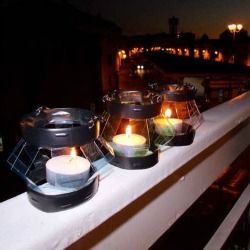 Save it to make a beautiful Plastic Bottle Lantern. Craftster member cold.dinner share their tutorial for taking every day trash and turning it into something not only swanky, but also functional. Using a little glue, duct and ingenuity, you can create lanterns that are useful any time of the year. Decorate the lantern for any season by painting the plastic. You can add other bits and pieces to fit your decor. If you are a little worried about using wax candles, try using battery operated tea lights instead. Make these lanterns in different sizes depending on the bottles you have. Let our Home Sweet Home Board light the way with tutorials, tips and inspiration for your next craft project. Happy Tuesday!